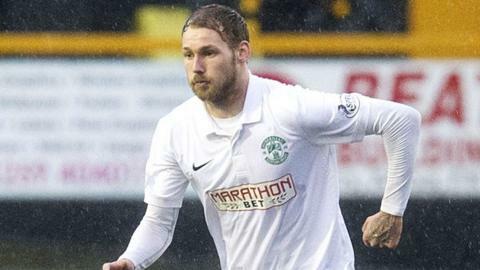 Hibernian have signed Martin Boyle on a two-year deal after the forward's contract at Dundee expired. The 22-year-old passed a medical with the Easter Road club on Friday having had surgery to repair medial ligament damage sustained against Falkirk. He joined the Easter Road side on loan in January, scoring three times. "I'm absolutely delighted to sign for Hibs on a permanent basis - I enjoyed every minute of my loan stay at the club," he told the Hibernian website. "Obviously I was gutted to miss the play-offs because of the injury, but I've made good progress in my recovery and can't wait to help Hibs push for promotion during the upcoming season. "We've got a good group of players here and an excellent manager - the future looks really bright and I'm excited to be a part of it. "I'm aiming to repay the manager's faith in me and show the supporters what I'm capable of by putting in some consistently good performances. "It was incredibly frustrating to suffer my injury set-back because I felt I was hitting some decent form, but I'm planning to come back stronger." Boyle's deal comes on the back of permanent contracts for Fraser Fyvie, Lewis Stevenson, Dan Carmichael and James Keatings, while captain David Gray agreed an extension to his deal. Head coach Alan Stubbs said: "We're delighted to have Martin on board for the new season and that the deal is now all done and dusted. "He is still going through his rehab process, but hopefully we'll have him back available for selection sooner rather than later. "Martin is another valuable addition to the squad for what promises to be an exciting season." It is understood Stubbs also hopes to extend centre-back Liam Fontaine's stay at the club. The Englishman joined the Leith side on a one-year contract in August following an eight-year stint at Bristol City.